babyba‧by1 /ˈbeɪbi/ ●●● S1 W1 noun (plural babies) [countable] 1 young childCHILDSSCBABY/HAVE A BABY a very young child who has not yet learned to speak or walk The baby is crying. She gave birth to a baby on Thursday. What do you think of your new baby sister? → test-tube baby2 young animalANIMAL/PLANTHBAHBP a very young animal baby birds3 vegetable a type of vegetable which is grown to be much smaller than usual or is eaten before it has grown to its normal size baby carrots baby sweetcorn4 youngestBROTHER/SISTERSSFCHILD a younger child in a family, often the youngest Clare is the baby of the family.5 woman spoken a) TALK TO somebodyLOVEused to address someone that you loveRelax, baby – we’re on holiday. b) TALK TO somebodyWOMAN not polite used to address a young woman that you do not know6 silly personSILLYSTUPID/NOT SENSIBLE someone, especially an older child, who is not behaving in a brave way Don’t be a baby! 7 responsibilityTHING something special that someone has developed or is responsible for Don’t ask me about the building contract – that’s Robert’s baby.8 thing informal something, especially a piece of equipment or a machine, that you care about a lot This baby can reach speeds of 130 miles per hour. 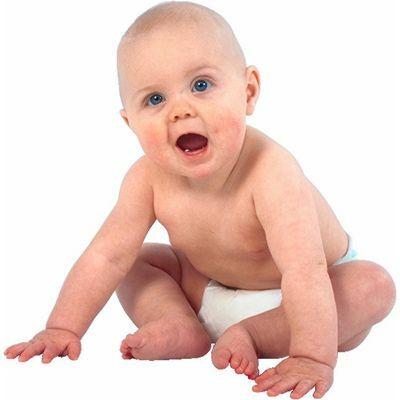 → throw the baby out with the bathwater at throw1(37)COLLOCATIONSverbsa baby is bornLet me know as soon as the baby is born.have a baby/give birth to a babyShe had the baby at home.Sue gave birth to a baby boy.be expecting a baby (=be pregnant)My wife’s expecting a baby.a baby is due (=is expected to be born)When is your baby due?lose a baby (=have a baby that dies when it is born too soon)She was three months pregnant when she lost the baby.deliver a baby (=help a woman to give birth to a baby)Usually your baby will be delivered by a midwife.abandon a baby (=leave your baby somewhere because you do not want it)A disturbing number of babies are abandoned by their mothers.feed a babyIf your baby cries, she may want feeding.breast-feed a baby63% of new mothers breast-feed their babies.change a baby (=change its nappy)Could you change the baby for me?adjectivesa newborn babyThere’s plenty of help and advice for people with newborn babies.an unborn baby (=not yet born)Drinking alcohol is bad for your unborn baby.a premature baby (=born before the normal time)Lesley’s baby was three weeks premature.an abandoned baby (=left somewhere by a mother who does not want it)The abandoned baby was found under a hedge.an illegitimate baby (=born to an unmarried mother)The number of illegitimate babies is rising.an unwanted babyUnwanted babies were frequently abandoned in the streets.a contented babyDanielle was a lovely contented baby.baby + NOUNa baby boy/girlShe’s just had a lovely healthy baby girl.a baby son/daughter/brother/sisterWe’d like a baby brother or sister for Ben.baby clothes/foodCOMMON ERRORS ► Don’t say ‘she is waiting a baby’. Say she is expecting a baby.THESAURUSbaby a very young child who has not yet learned to speak or walkI sat next to a woman holding a baby.toddler a baby who has learned how to walkThe playground has a special area for toddlers.infant formal a baby or a very young childThe disease is mainly found in infants.little one spoken informal a baby, or a small child up to the age of about threeHow old is your little one?young the babies of an animal or birdKangaroos carry their young in a pouch.litter a group of baby animals that are born at the same time to the same motherOur cat has just had a litter of six kittens.